As part of Herrera’s community outreach efforts, Herrera scientist George Iftner and stormwater engineer Ondrej Sklenar were special guests in Ms. Massimino’s and Mr. Castelli’s 4th grade classes at Louisa Boren STEM K-8 School in West Seattle. The topic of their visit was Lake Washington history and water quality. The kids were intrigued by all of the sources of water in the lake: direct rainfall, stormwater, groundwater, and combined sewer overflows. George and Ondrej talked with the 4th grade scientists about the lake’s geology and formation by the Puget lobe of the Cordilleran Ice Sheet. They discussed the ways the lake was historically used by the Duwamish people, and how the watershed changed with the construction of the Montlake Cut and Ship Canal in 1916. The students asked great questions and were already quite knowledgeable about the various sources of stormwater pollution in our urban environment from cars, trucks, homes, lawns, and pet waste. They seemed most interested in how the City of Seattle is retrofitting structures to reduce combined sewer overflows. They also talked about how wastewater treatment plants work and why the West Point Treatment Plan shut down and released untreated sewage into Puget Sound in 2017. A lively discussion ensued regarding what lives in the lake today (fish, plants, snails, crayfish), aquatic invasive species (Brazilian elodea, Eurasian milfoil), and what lies on the bottom (sunken coal barges, cars, and crashed airplanes). 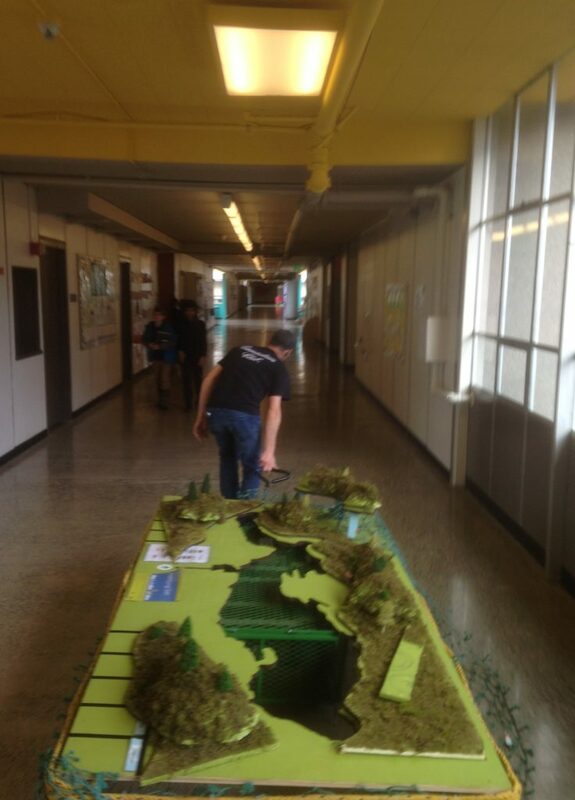 George and Ondrej used the model of Lake Washington, that Herrera first created for PARK(ing) Day 2017, to illustrate different points of Lake Washington history and show the locations of the combined sewer overflows. Students were excited to have an opportunity to “go fishing” in the model for species that currently live in the lake (both native and non-native). George and Ondrej had fun sharing their knowledge with all the young scientists and were impressed with one 4th grader’s summary of how waste treatment plants operate. It sounded like a great preview to her future PhD thesis!